Welp, my due date is exactly four months from today, which essentially means I'm five months pregnant, right?! Some days, I feel like it; other days, I don't. Some days, I think I'm ready for life with three kids. Like, I'm ready to watch Brantley and Holden interact with the new baby. And I'm ready to see who he most resembles. Yet other days, I'm honestly not sure how we're going to do it. Life with two kids has plenty of challenges as is, and a little nervous to throw a third into the mix! Regardless, November 25 is fast-approaching and I'm both counting down and appreciating this "simple life" with two. 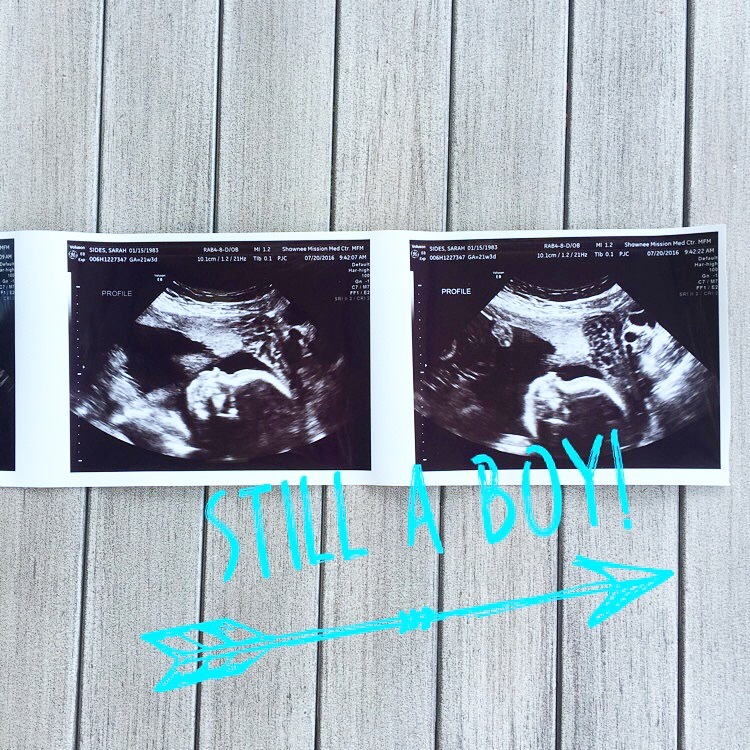 Last week, we went for our follow-up sonogram since they weren't able to get a good picture of the aortic arch at 17 weeks. Luckily, they saw what they needed to see right away and everything else looked good, as well. The baby was moving nearly the entire time and giving the technician quite a run for her money. Hoping that's not a sign of what's to come! She also confirmed it's a boy! That definitely made me feel better moving forward. We also recently started progress on the nursery. In case you missed it last week, here is my inspiration. It's coming together quite nicely...and very quickly. When I get my husband on board with something, we are both very anxious to see the end results. Anyway, the crib has been set up and the Craigslist dresser has been re-finished. I also painted our changing table blue, and so far, I'm loving how it looks! The walls of the nursery still need painted, but we wanted to arrange the furniture first so we know where the crib will sit (so we can decide what to do with the wall behind the crib--blue accent wall, wallpaper, or the same color as the rest). Just like when we were designing Brantley's nursery, I love peeking into the room, sitting in the glider, and dreaming about what's to come. 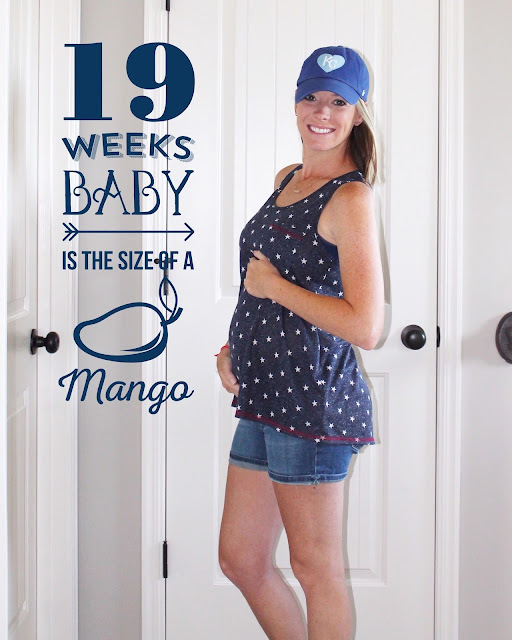 Size of Baby: The size of a papaya. Weight Gain: 20 pounds at the 20-week mark. I haven't bothered (or cared) to weigh myself since! Although I'm on track to gain more weight this time than with each of my two previous pregnancies (29 pounds total with Brantley and 34 with Holden), I'm not stressing about it. It's my final pregnancy and you know what, I'm not going to deprive myself. I have always believed in eating in moderation and I'd rather live a happy life full of goodies than a sad life full of healthy food all the time, especially while pregnant! Food Cravings: I wouldn't consider this a craving (after all, I didn't make a trip to the store just to buy them) but the grapes lately have tasted so, so delicious! Can't get enough! 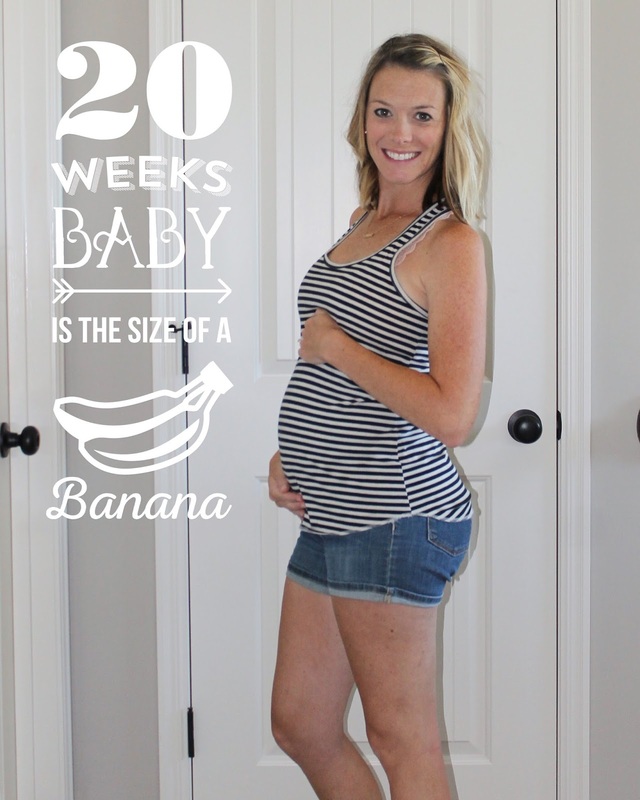 Movement: I am finally feeling the baby on a consistent basis! The movements aren't quite strong enough yet to feel from the outside, but I definitely feel him wiggling and flipping in there! Sleep: Minus this crazy heat, I'm sleeping pretty well! I usually get up once per night to pee. Clothing: About 50% maternity shorts, the other 50% regular (stretchy shorts or shorts with my Bella band). Mostly regular tops still since flowy tops are all the rage. Other Pregnancy Symptoms: My left hip bone feels bruised from sleeping on my left side. Also, just recently (like two nights ago), I woke up with horrible Charlie horse cramps in my legs and feet. Horrible! My feet and hands feel swollen on occasion (had to take off my wedding band yesterday), but again, likely due to this heat more than anything. What I Miss: I miss feeling like a normal person at the pool. I either wear my two-piece and feel large and in-charge or I wear my maternity one-piece and feel....large and in charge! Last week when I put on my one-piece for the first time, Brantley said "Is that a swim suit, Mama!?" Looking Forward To: I mean, I'm not looking forward to going back to school at all, but I guess if I have to go back (in two weeks! 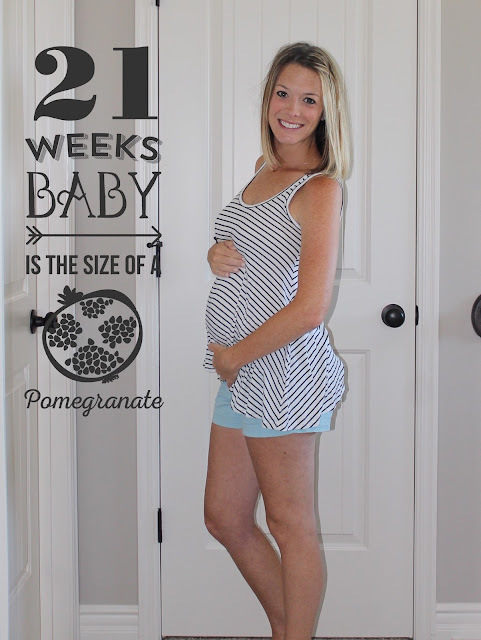 ), that means my third trimester is just around the corner! Also, I'm sure my old students will be anxious to hear the baby is a boy and anxious to see how much I've grown. Getting legit dressed each morning, however, is not going to be fun! And finally, here are my bump photos from the past month! And remember, I post them on Instagram on a weekly basis if you want to follow along on there! 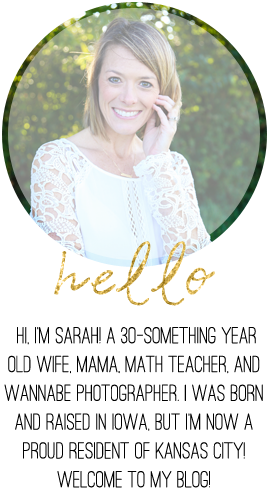 Tomorrow, I'll be back with a few wishlist items for Baby #3! You look adorable! Can't wait to hear the name! Wahoo 5 months!! Glad to hear your appointment went well and baby is for sure a boy. Ha ha! And that they got all the photos they needed. That's so great. Boo to going back to work soon. I just started getting the charlies as well. ugh. I kind of forgot about those with Aria. So fun getting an extra sonogram! Esp when they are moving around so much. Mine was at the 20 and it was so fun to see, esp since I hadn't felt him much at that point. And those grapes, I grabbed two bags over the weekend. You are so freakin' cute, friend! So glad you guys were able to see the baby in another sonogram. That is always so exciting! Can't wait to hear baby #3's name!!! Ugh, Charlie horses are the worst! Girl, you look amazing! You are giving me serious serious baby fever. I've been begging my husband for a 3rd and sometimes I think I'm nuts, but then I read this and WANT A BABY!! I'm crazy obsessed with the nursery you're doing! LOVE everything about it! I can't wait to see how it turns out! You are freaking adorable. Seriously. Just reading about feeling the little movements has me missing that so much. And, makes me want a third even more (to get Scott to agree has proven to be oh-so difficult). You are so cute!! 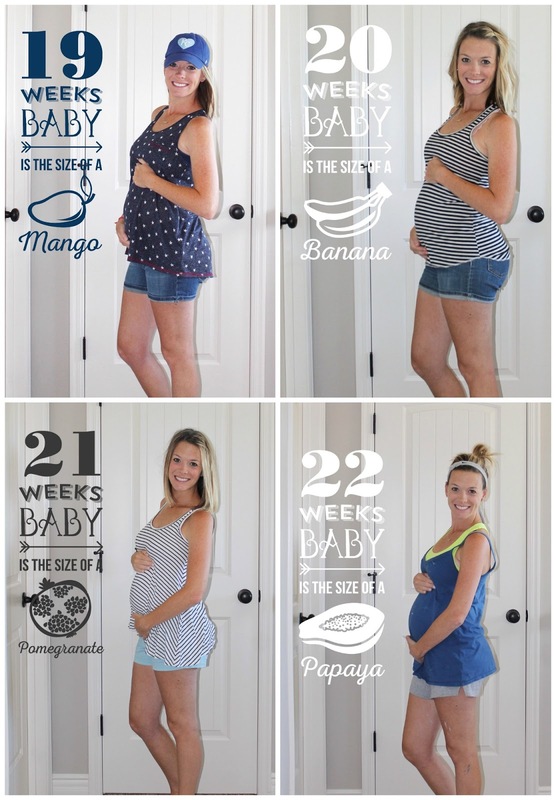 I love these pictures and I love that you are still taking weekly pictures even though it's #3 (I know a lot of people get lazy even with #2 and I love that you are still documenting this pregnancy as if it was your 1st). YAY YAY YAY for having a name!!! That's so exciting!